Pathology plays a particularly important role in preventive medicine by ruling out diseases or detecting them early. The medical laboratory is one of the first stops in preventive medicine, which puts pathology among the most important health care services. Because it is predicted that preventive medicine will continue to become even more important in the next decade, laboratory and medical testing will be in greater demand to rule out incorrect diagnoses, to detect diseases early -- in many cases before any symptoms arise, and to insure that a chosen treatment is working to the benefit of patients. Microbiology This science studies, examines, processes and deals with microorganisms, the tiny living bodies not visible to the naked eye, such as bacteria, yeasts, moulds, and so forth. Biochemistry This science studies, examines, processes and deals with molecular and anatomic structures of matter, and the composition of substances. Histology This science studies, examines, processes and deals with how Histologists examine extremely thin slices of human tissue under microscopes, using dye to increase the contrast between cellular components. Immunology This science studies, examines, processes and deals with the Branch of science that deals with the study of the body's immune system. Haematology This science studies, examines, processes and deals with medicine concerned with the nature, function, and diseases of the blood. It covers the cellular and serum composition of blood, the coagulation process, blood-cell formation, hemoglobin synthesis, and disorders of all these. 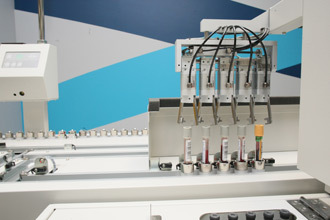 Transfusion This science studies, examines, processes and deals with the place where blood is processed, typed, stored, and broken down into components until needed by patients. Cytology This science studies, examines, processes and deals with the formation, structure, and formation of cells. Molecular This is a cross-disciplinary field that studies molecular materials, structures and systems and their application. Please click here for more information on how you can prepare for your medical tests with Pathlab.